Description: 5x6 R.E.M. 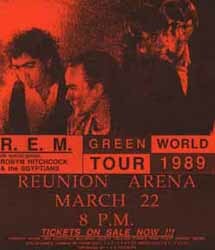 1989 concert handbill. Description: 5x9 Rollins Band / Helmet Arminski 1995 day-glow handbill. Description: Rollins Band 1995 Deep Ellum Live Handbill.